I remember being skeptical the first time I purchased lump charcoal, wondering if it could really be much different than briquettes from the grocery store. But from the moment my chimney starter fired up, I was a believer. The smell was amazingly deep, woody, and complex compared to the plain old briquettes I had used previously. And something about the natural wood-shaped chunks just felt right. In this article I’ll give my opinion on the best lump charcoal, explain what makes this stuff really great, and tell you the best brands for specific cooking scenarios. What Exactly is Lump Charcoal? What Makes a Good Lump Charcoal? You’re probably here because you want to learn what the best lump charcoal is, so I’ll cut to the chase. My recommendation is FOGO hardwood lump charcoal. The first thing you’ll notice when opening a bag of FOGO charcoal is the size of the chunks. They are generally large, but not massive, and I found them to be the perfect size. While there are some smaller chunks mixed in, you won’t find a bunch of dust and tiny broken bits. You may have to break some of the bigger pieces with a hammer or other tool, but it’s very easy to split the lumps. When lighting up FOGO there are minimal sparks. Once it’s lit, you’ll notice it burns through at a moderate rate. Some charcoals burn extremely hot at a fast rate, and others burn slower and cooler. One thing I love about FOGO is that it’s a happy medium – noticeably hotter than briquettes, but the heat isn’t too intense. FOGO notes that the only ingredient used to make this charcoal is Oak hardwood. This creates a nice, mellow smokey flavor that works with a variety of foods. While the punch that mesquite charcoals provide can be nice at times, it can be overwhelming with a lot of foods. With all this being said, there are still other quality brands on the market. I cover a few of those in this below (click here to jump to that section). Now that the main question has been addressed, let’s focus on what makes this stuff unique. Lump charcoal is nothing more than wood that has been carbonized – burned down in a low oxygen environment – until the moisture and other chemicals have disappeared. The process creates lumps of charcoal that are mostly pure carbon. Lump charcoal is additive-free and all natural, and as a result it retains its original shape. Though lump charcoal an briquettes are interchangeable in most situations, there are still considerable differences. First off, lump charcoal lights up faster than briquettes, so you won’t have to wait as long to get grilling. Another benefit of lump charcoal – perhaps the main advantage – is that it burns hotter than briquettes. This allows you to get a better sear on your meat. During the cooking process, lump charcoal creates less ash than briquettes since it is free of binders. Ash can get on your food, and it also means you’ll have to clean your grill more often. 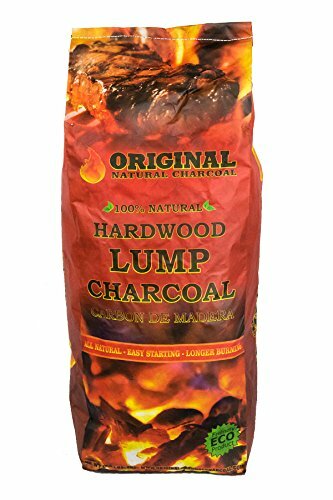 Last but not least, lump charcoal is completely natural and contains no additives. Briquettes contain saw dust and other materials used for their shape, and the “instant-light” variety often contains lighter fluids. The purity of lump charcoal is appreciated by both the health-conscious and those with discerning palates. Quality lump charcoal should not have a lot of tiny bits and carbon dust in the bag. These should be filtered out during the production process. But remember that a small amount of dust is unavoidable due to production handling and the shipping process. Second, when you light up your lump charcoal, it shouldn’t create a ton of sparks. That’s a sign of low quality wood and/or a poor carbonization process. And speaking of lighting charcoal, it shouldn’t be a long, tiresome process. While lump charcoal won’t light up like briquettes covered in lighter fluid, getting your charcoal lit should be no problem with a chimney starter. Your charcoal should also smell great, which is honestly one of my favorite aspects of working with lump charcoal. Not all of the smell will translate to whatever you’re cooking, but the natural scent really makes the cooking process more enjoyable than working with briquettes. If you’re getting acrid fumes when lighting up your charcoal, something is wrong. One more subjective aspect of choosing the best lump charcoal for you is the type of wood used. Some lump charcoals are single-species, meaning made from only one type of wood. Woods like hickory and mesquite can provide more intense flavor, while most others are more mild. Another subjective point is burn temperature and speed. If you’re searing steak, you’ll likely want higher temps. On the other hand, if you’re smoking you’ll want something that burns for a longer amount of time. Also keep in mind you can control burn rate with most charcoal grills by adjusting the dampers. 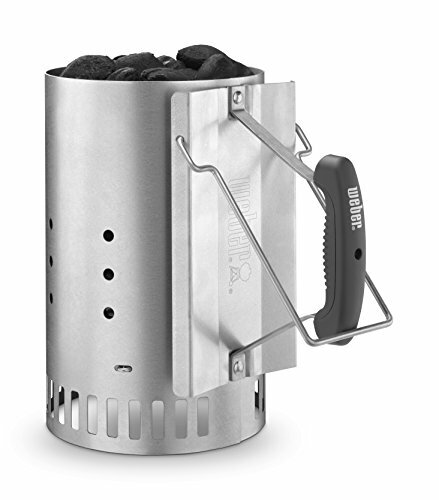 My personal favorite, and the simplest device, is a chimney starter like this one from Weber. In fact, I find that a chimney starter is absolutely essential if you grill with any regularity. If you’re not familiar with how they work, you stuff some newspaper in the bottom portion of the cylinder and fill the larger area above with your charcoal. Light up your newspaper, and your charcoal will be ready to go in 10-20 minutes (depending on the type of charcoal, size of the pieces, and overall amount). It’s dead simple, and it doesn’t require electricity like the two devices below. Some folks, such as Alton Brown (see video below), prefer to use a fire starter that blows hot air on the coals. 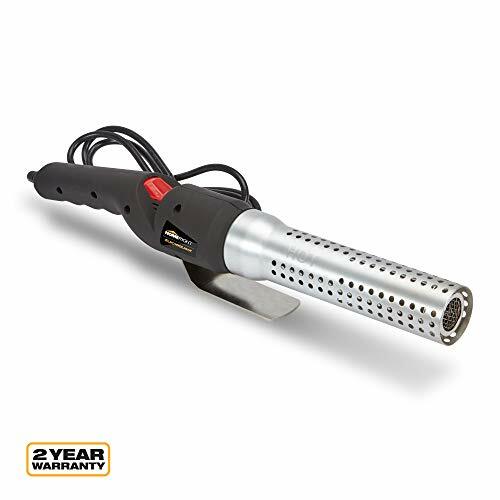 This device is essentially a super-powerful blow dryer. One advantage of this fire starter is that it allows you to set up your coal pile beforehand – in other words, you won’t have to deal with sparks from dumping hot coals. 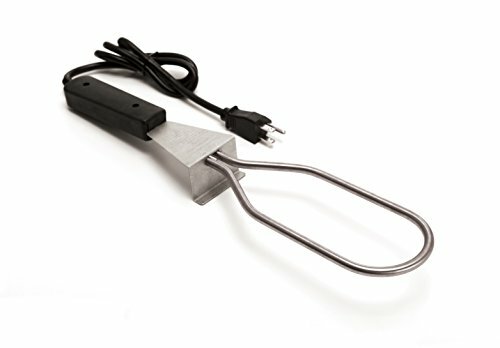 It’s also faster than using a chimney starter, but you will have to run a wire out to your grill, which may be tricky for some. The last device is a simple electric starter. To use this type of starter, you just place it in direct contact with your coals. In less than 10 minutes, your coals will be ready. While it is faster than a chimney starter, it doesn’t allow you to light up several areas in your pile like the air-blower starter. As a result it might not immediately produce an evenly lit charcoal pit. And again, you will have to connect this to an outlet. With whatever method you choose to light up your coals, you should be mindful of airflow when setting up your pile. Some folks think making a compact pile of charcoal will produce the most heat, but they are actually creating an environment where air can’t flow freely. Make sure your charcoal can get oxygen! One of the coolest things about using lump charcoal is that you can cook your meat by laying it directly on the hot coals. I know it sounds crazy, but it works great! The first time I tried this, I thought the charcoal taste would be overwhelming, but that wasn’t the case at all. I also anticipated my steak turning into an ashy mess, but that didn’t happen either – the small ashy spots on the surface disappeared when I let the meat rest. If you’re using your lump charcoal to smoke meat, you’re probably more concerned with burn time than high temperatures. Rockwood is a great choice for extended cooks. 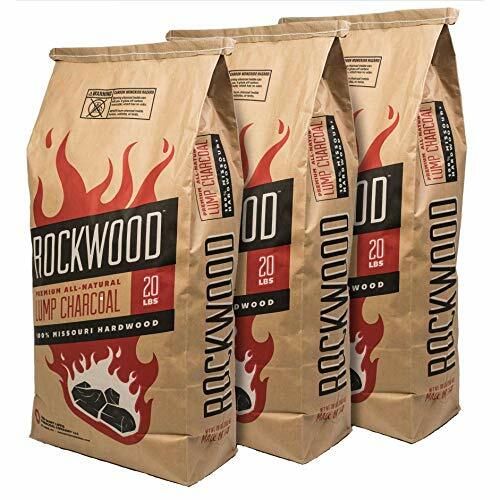 This lump charcoal is a delicious blend of Oak, Maple, and Hickory that isn’t too overpowering. And it’s made in the USA, from Missouri hardwoods! If you’re mainly concerned with creating the highest temperatures possible for a fast, amazing sear, then Original Natural is the brand for you. It grades out as one of the hottest of all lump charcoals. It’s also made from a blend of Oak, Apple, and Cherry, which makes it a versatile choice that works great for beef, pork, poultry, and just about anything else. Are you in need of a charcoal for your Big Green Egg? Look no further than Jealous Devil. This charcoal has a mild flavor that works great for longer cook times. If you’re cooking with charcoal for an extended amount of time, it’s important that it doesn’t overpower the natural flavor of your meat. 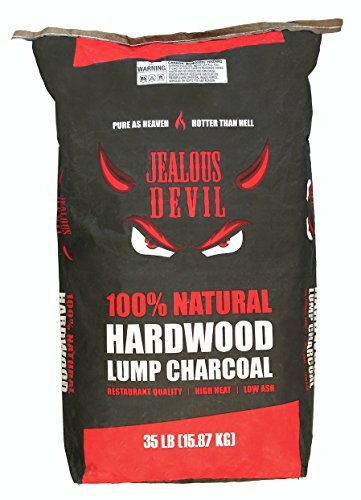 Additionally, Jealous Devil lump charcoal burns for three times longer than traditional charcoal. 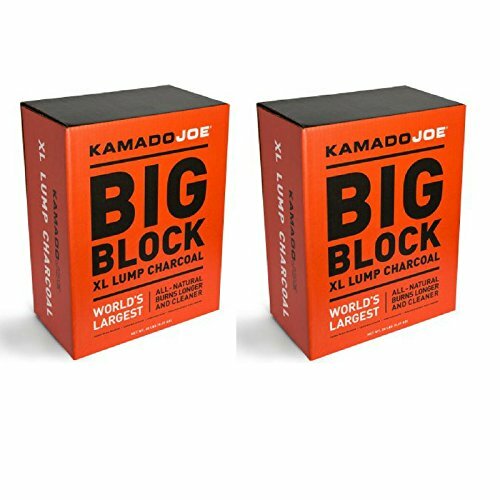 If you need a charcoal for your Kamado-style grill, go with the obvious choice: Kamado Joe Big Block. This lump charcoal is made from a hardwoods so dense that they are referred to as “axe-breakers.” That means these big chunks of wood burn longer than the competition, so they can handle whatever you want to cook. 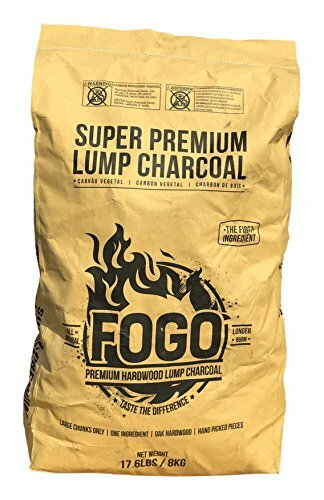 The main purpose of this post was to share my choice for best lump charcoal, FOGO, but I hoped you learned a lot more! If you have any more wisdom relating to charcoal or want to weigh in on the ongoing lump vs. briquette battle, please leave a comment below!